Well this one was different from the rest of Hunting’s work. In her newest novel we get to follow the story of Kailyn Flowers, a trust lawyer with a passion for families and a not so secret obsession with the hit TV show “Its My Life”, and Daxton Hughes, former child star turned entertainment lawyer. 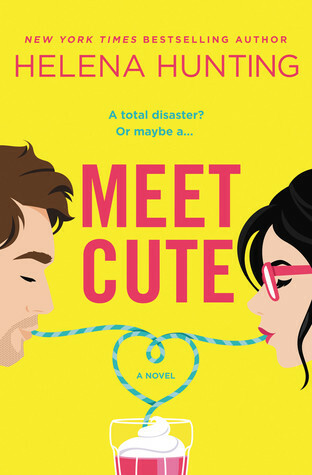 After a meet cute encounter in law school that goes Awry, Kailyn’s long time crush for the former child star turns cold and she vows to have nothing to do with him or her beloved show anymore. However, after a tragic accident hits Daxton’s family, Kailyn finds herself at the center of Daxton’s life as he fights for custody of his little sister. I actually enjoyed my time reading this book, however it wasn’t as much as I once did with Helena’s previous works. The first half of the novel was a struggle to get through as every page seemed to only talk about what happened to Daxton’s family and how traumatic the experience was–which I mean yes, the Hughes family’s world has turned upside down, but I felt like the constant reminder of what happened took away from the growing romance between Daxton and Kailyn; and that when we are finally given a chance to see the romance and nothing else, it felt forced and sprung out of nowhere. Apart from the constant Debby downer tone, I was smitten with our characters–especially Kailyn. Tough and no-nonsense during working hours, however when off the clock Kailyn showed a vibrancy to her that only a select few in her life got to see, which I really enjoyed and related to as the novel went on. I absolutely respect her passion for families and going out of her way to make sure that her past experiences never happen to future generations of children. The pace and the writing was what I expected from Helena Hunting and I loved how everything flowed and didn’t feel like it was dragging in any parts. Chemistry and banter between not only Daxton and Kailyn but between both of them to the other characters when they put on their lawyer pants, was a 10/10 would recommend time! Overall, apart from the depressing tone of the novel, I did really enjoy my time with these characters and watching a family take shape after difficult circumstances rock their world. Daxton and Kailyn were super cute together and the moments I did see with them without the depressing tone were ones I LIVED for. I recommend this to anyone who is looking for a good romance that can look past the dark tonality of the story, as Daxton and Kailyn’s story is truly worth it. Huge thank you to Forever Publishing for sending me an ARC for my honest review! Quotations taken from an uncorrected proof and may change upon final publication. Next postRESOURCE: Bookish Puzzles + 500 Followers Giveaway! I’m so glad I saw this review because I expected this book to be extremely lighthearted for some reason, and it’s good to know it’s not all rainbows and sunshine. I also really want to check out Helena Hunting’s other works now, especially since i only recently learned she has more books out besides Meet Cute. Great Review! Thank you! Glad I could help! It’s a good story just not what is advertised. If you are interested in her other works, I absolutely adore her hockey series! Definitely had to rework the brain when I realized it wasn’t a feel-good romcom like I had anticipated. But once you get through 50% it starts to become more enjoyable! lmao. From the title, and even the cover,I would expect this to be a fun,light read but I’m glad I read your review and know what to expect going in. This sounds like such a wonderful read. And that cover!!! AHHH! !